For tech recruiters, the pressure is on to deliver results. Only 48 percent of CEOs interviewed for a PwC survey said they are satisfied with their recruiting solution. Nearly 80 percent said they're concerned a lack of skills threatens their company’s growth potential. But what can a tech recruiter do to gain an edge in this tough hiring market? Many of today’s tech pros are passive job seekers — and hard to reach. And candidates with specialized skills know they’re in demand, and expect employers to work hard to woo them. The Answer: You need to become a master at timing. 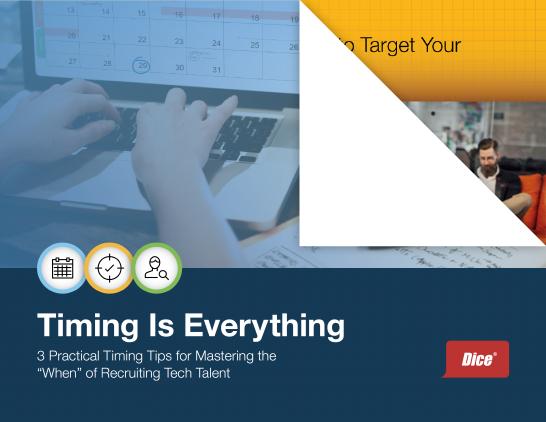 To help you do that, Dice's data science team analyzed thousands of tech pros’ profiles to provide data-driven insights on how recruiters can work more efficiently and improve candidate engagement. You won't want to miss these practical timing tips — fill out the form to download your guide now.